This is a plastic model kit of a 1/35 Scale U.S. WWII Infantry Soldiers from the West European theater of war, manufactured by Tamiya. Recommended for ages 10 and over. Retail $7.25 SAVE 20% ! Highly detailed parts are molded in dark green and attached to sprue trees. 8 total soldiers, all in various poses of movement, some in battle, some merely walking. Box includes painting schemes and photos of finished soldiers. Soldiers all have helmets and are represented by drab military uniforms that are fairly loose fitting. Pieces include unassembled body parts, helmets, backpacks, armament, and canteens. Box contains nearly all Japanese writing, along with some English and very helpful illustrations. They matched perfectly all I need to do now is put them in a diorama. This set has seen better days. It&apos;s still a good kit though. You&apos;ll need to a fair amount of filling and sanding. Great for beginners to learn on. 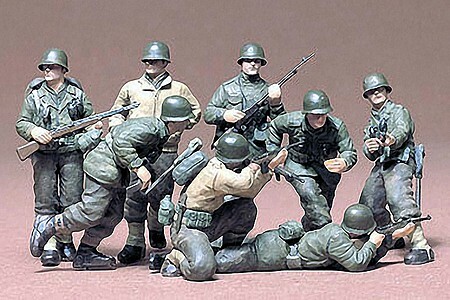 "Just OK for the price, not more"
These figures are made with somewhat dated 70&apos;s technology and it shows, but can be made to work for you for ww2 or Korean War or even US Allies post war period with some work. If you are going for a really detailed project get another more detailed product like Dragon etc... , but if you are looking for low price, and simplicity of building and can deal with just OK quality, these are fine for you.I think the low price is the selling point for me. Keep from children ages 3 and under, due to small parts which may cause choking.